We are seeing more of the Ambarella A7 processors in 2014 and this one records at 1296p at 30f/s with a bitrate of 21Mbps or 1080p at 30f/s with a bitrate of 15Mbps. Most owners indicate there is no noticeable video quality difference between 1296p and 1080p. Video quality during the day is very good and night quality is good. The biggest improvement of this camera over the Mini 0801 is the video quality at night. While the video is better than the Mini 0801, many owners have been disappointed with how clear the video is, particularly over sharpening which makes details blurry. Recent versions are much improved over the initial versions but the video still has room for improvement. The camera has a nearly identical form factor as the Mini 0801. It has the same small size (75x47x3.5mm), 62g weight, 1.5″ screen and G-sensor. While the Mini 0801 came with a Mini USB port, the Mini 0803 typically comes with a Micro USB port (some do come with Mini USB). The Mini 0803 comes with a quick mount that has electrical contacts built it. Note that recording is done either on the internal memory card or external memory card. Video recording cannot span both memory cards. While overall build quality of the Mini 0803 is good, the GPS connection mount is not the greatest. 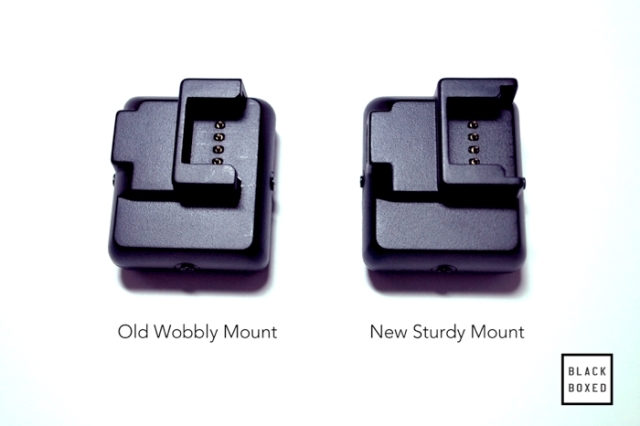 Many owners have indicated that the mount is loose, wobbly, shakes and does not connect firmly to the camera. The following video illustrates the problem. The contacts on the base are spring loaded and sometimes do not connect firmly as well. The spring loaded pins connect to the flat tabs on the 0803 housing. See the picture below where the leftmost pin is lower than the other 3 pins. This could cause the camera not to function. To resolve this problem, some owners have added 1 or 2 layers of electrical tape or plastic shim to make the connection more secure. Others have used a contact enhancer product called Stabilant 22A to improve connectivity of the spring contacts. Alternatively, you can forgo the base and plug the camera directly into the USB cable. Numerous owners have indicated that the Mini 0803 will freeze on start up on the welcome screen. It typically will make a loud, continuous sound and the on / off button does not work. If the camera does not turn off, hold down the on / off button for 10 seconds. This will force it to shutdown. You may need to remove the micro SD card as well. Currently there is no known resolution to this problem. Some owners have complained of dark playback for their videos. Make sure the camera is angled downward (shows 1/3 sky, 2/3 road / car). Also try using EV +1.0 and AE Center to get a brighter image. Pressing the mute button doesn’t result in the mic being muted after the camera is restarted despite the mute icon showing correctly. This is a known bug and has yet to be resolved. Running 1080p mode is a few degrees cooler if you are concerned about overheating. As of the summer 2014, a heat sink has been added to the Mini 0803 which should reduce operating temperatures. Thanks to niko for disassembling his Mini 0803 and sharing the photos. The Mini 0803 is an improved version of the Mini 0801. Same great form factor, a lot of features and reasonable price make this a good buy. Just be aware that video quality is not perfect and many people prefer the cheaper NT96650 based cameras. That being said, future firmware updates will likely improve the video quality of the Mini 0803. Also the Mini 0801 was not the most reliable camera so we are waiting to see how the Mini 0803 reliability plays out. If you don’t need the screen and GPS the Mobius is a more proven choice. Overall the Mini 0803 is a good value for the money assuming good reliability. To see what other owners are saying, visit our Mini 0803 Forum. One of our members has rewritten the Mini 0803 user manual to be more accurate and provide more detail. The manual can be downloaded here. Final Word Discreet, small, GPS and reasonably priced. Loose mount and over sharpening issue. If it proves to be reliable, it is a good buy.